Oh, and that isn't a picture of a sleeping dragon - it's the side view of a pie in a blue pie dish - that's the crust along the top edge. I think I have to make an apple pie tomorrow? Also, she's not a psychopathic serial killer - I started by asking that and the teacher laughed merrily and said she thought she was a politician or lawyer in the making. Which is funny because from day one we've said she's going to be the Mayor (and yes, that was well before I got to know O The Joys, who has a Mayor of her own). I'll shut up now. Have a lovely Thanksgiving tomorrow. And I think she's got mathematician in her future. PI. Snirk. that picture is enough to get a mama's heart thumping! happy thanksgiving!! "Who needs vowels?" is what I always say. Yep. You need to bake an apple pie immediately! I'm just happy she didn't write "foie gras." frame it. hang it in your kitchen. Now THAT, is a beautiful crust! I love those first words. I wanted to hang on to everything my girls first wrote. That's a girl: she knows the important words! She's already campaigning for 2048? It's never too early! I heart invented spelling. And pie. First written words, how cool! Happy Thanksgiving! Me can read guess and go spelling good. But only because I have a first grader. Woot! Proud Mental P in this corner! Blessings. isn't their writing the sweetest thing? I love the way they write things in the beginning. It strikes me a so innately clever. 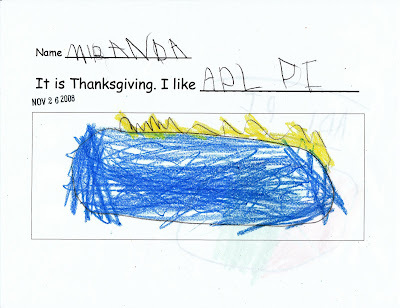 What a proud moment--I hope you made that apple pie! I also hope you had a wonderful Thanksgiving.